Gives full access to all functions and registers in the MAC motor. Possible to connect up to 7 modules (Requires a Bluetooth server). Programmable via wireless control with MacTalk. 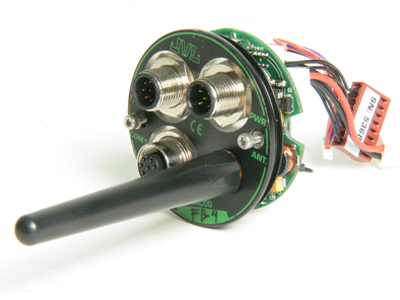 The module can be wireless set-up and programmed from a PC or IPC via a COM port. There are 5 in- and 4 outputs for home or limit switch sensors. Programming is done exactly as with the MAC00-Rx nanoPLC module, where advanced programs with arithmetic functions can be programmed from MacTalk. With a special mirror mode it is possible to have an input on one wireless module mirrored to an output on another wireless module without any programming. Typical applications can be where a motors is moving around and therefore need power, sensor signals and communication through a slip ring. Other applications could be where the control signals come from battery powered, hand-held equipment, and a cable therefore not can be used.